Is it wiser to view a depressed market that’s improving as weak or recovering? Since early 2012 when housing prices stopped going down, I characterized the price rally as a reflation of the old housing bubble rather than a price recovery. IMO, the crash was the price recovery because the prices that preceded it were a bubble with no tether to fundamental values. The price crash restored market prices to values supportable by income and rent. However, most people don’t want to see this reality, particularly deeply underwater homeowners. Most want to believe peak housing bubble prices were fair value and the crash represented a deeply undervalued condition that needed to recover back to fair value prices. This viewpoint requires people to believe that record low interest rates and a bevy of market manipulations were needed to restore fair value rather than restore artificially high bubble-era prices. A durable housing recovery based on improving fundamentals would be hard to deny, and it wouldn’t need so many artificial boosts. A real recovery would be characterized by resurging new home construction and steady gains in sales and prices commensurate with strong job growth and rising incomes. Although these conditions are improving, by most measures the economy and the housing market are still weak. It comes down to how each individual wants to view the rally. Is the market improving (glass half full) or is it still historically weak (glass half empty). Unfortunately, seeing the glass as half full with regards to investments a path to ruin. Historically, taking a glib and Pollyanna view toward major investments is characteristic of herd behavior in a financial mania. People need to make important decisions about housing with their eyes open to the potential disasters, not just to the potential rewards. This is a basic philosophical difference I have with most financial writers who view their work as investor therapy, a source of reassurance for decisions already made. People who bought houses want to read the housing market is going up and prices will head to the moon, so that’s what financial reporters tell them — except for Barry Ritholtz. He prefers reality from what I can tell. We interrupt this crash and recovery for a brief word about the economy, in particular residential real estate and new home sales. This is an area of the economy I have been studying and writing about for decades. New home sales were reported earlier this week; they are a component of gross domestic product (existing home sales are not). We learned this morning that second quarter GDP was revised to 3.7 percent. So new home sales are especially important, even though they make up less than 15 percent of total housing sales. A few things you should know about this data: Month-to-month, it is a very noisy series. It is self-reported by builders, and I always have gotten the sense that they get around to doing the paperwork…eventually. Quarterly figures are more or less accurate, but each month comes with a high double-digit probability of statistical error. I want to draw your attention to two of my favorite charts, courtesy of Bill McBride of Calculated Risk. He uses data in a way that is most informative. The relative scale of the housing market’s poor performance is readily inferred from the chart above. Those tall bars represent sales during the final stages of the housing bubble (which were above normal), and the short bars at the bottom show the dismal performance since 2008. The chart above is new home sales, presented as a monthly series on an annual non-seasonally adjusted basis. Each colored bar represents a different year. Looking at new home sales this way allows us to easily see the “Seasonal Homes Sales Trend.” Home buying occurs on a very specific annual cycle, rising in the spring, peaking in the summer (got to get the kids enrolled in the new district before school starts) then tailing off in the winter. By omitting the seasonal adjustments, we get a cleaner look at the actual sales data. We also see how strong or weak any given year is. Note that for the longest time, much of the media got this wrong, misreporting month-to-month data as a recovering housing market, instead of as part of the usual annual cycle. Since the financial media is spoon fed by the National Association of realtors, it isn’t surprising it’s often wrong or spun to create a false impression of strength. Let’s take a look at July: Last month — shown as a red column — had 43,000 new home sales, the highest July sales figure since 2008. In July 2014, the number was 35,000. It pales, of course, to the all time July high in 2005 — that was 117,000 — but it’s a lot more than the recent July low of 26,000 in 2010. 2005 was unusually high, but the long-term average is still nearly double recent sales volumes. The good news is that the Census Bureau reports new home sales so far this year at 316,000 — again not seasonally adjusted — up 21.2 percent from the same period last year. The bad news is that, despite record low mortgage rates, these numbers are still close to what we used to think of as cyclical lows. That brings us to our second chart: 50-plus years of new home sales and recessions. As you can see from the yellow line, new home sales are now just above the lows of earlier recessions as shown by the light blue bars. I reported on this back in 2013 when New home starts surpassed lowest pre-bubble low of last 45 years. Even then, the glass-half-full crowd touted the strong recovery. There are a couple of reasons why new homes sales are trending so much below their historic averages. First, the post-credit-crisis recovery has been (as expected) modest at best. This includes weak wage gains combined with tightened standards for extending credit to buyers. That alone accounts for much of the weakness in both new and existing home sales. Second, and more specific to new homes, that giant decade-long boom from 1998 to 2007 created a huge oversupply of new construction. That fulfilled (perhaps “exhausted” is a better word) much of the demand for new homes. Third, maybe most significant to new home sales, the aftermath of the financial crisis created a huge number of distressed sales — foreclosures, short sales and owners desperate to sell and reduce debt. Losses taken by banks and homeowners acted as net discounts to buyers, which functioned as price competition to new construction. So it’s not too much of a surprise that the recovery in new home sales is lagging the recovery in existing home sales. Builders should be happy that sales of distressed properties have been falling to the point where competition for new homes is waning. Also back in 2013 I reported that Low MLS inventory was a boon to homebuilders. The slowdown in foreclosures caused the MLS inventory to evaporate, and the result of the federal reserve stimulus and the lack of MLS inventory is a supply of homes that fails to meet demand. Builders take advantage of the situation to ramp up construction to deliver the supply the banks are not. Will this weak recovery in new home sales continue? I expect that will be a function of the health of the economy at large, in particular employment and wage gains; how soon credit availability swings back toward normal; and how fast and high the Federal Reserve takes interest rates. All of those factors are in play, but the more basic truth is that housing’s performance is so bad, it can’t help but get better. There is really no way to argue with this contention because it’s an appeal to faith. You can easily imagine this specious argument being made by housing bulls in 2006 when sales dropped from 1.4M to 1M annual sales, and again in 2007 when sales dropped from 1M to 600K annual sales, and again in 2008 when sales dropped from 600K to 400K, and every year since when sales languished at 50-year record low levels. We are still only building a few more homes than we did at the bottom of the worst recessions since 1962. I suppose it can only get better… eventually. Is the glass-half-full interpretation particularly helpful? Great to see these $2.5M ocean view properties below rental parity again. Based on comparables in the neighborhood, The $9,995 rent is reasonable, although that’s a pretty thin renter pool. When I first talked about rental parity back in 2006 and 2007, people said beach communities would never have properties available at or near rental parity. Most houses trade well above that price, but sometimes properties near rental parity are available. 240 San Joaquin actually has recent rental listings; $7500/mo for the main house and $2500/mo for the above garage unit. So there’s your monthly income assumption (optimistic IMO). But I’m not so sure about the “10” rating even with 10K rolling in. Just deducting $2500/mo for taxes leaves $7500/mo to pay the nut. At 4% that’s a mortgage of about $1,570,000. So the buyer needs 1,000,000 down to break even before gardener, water, insurance, etc. So wouldn’t all properties be “10”s when you can pay all cash and trust that your equity is secure? Does buying at “rental parity” mean paying all cash when we’re talking about an income property? Does the concept of “rental parity” have meaning in a cash purchase? I’m trying to image a cash purchase where the remaining expenses are above rent for a similar property (excluding rent control). Recently you profiled 490 Thalia, also a “10” with a $12k monthly rental assumption. I would be surprised to learn that 490 Thalia would rent for above $4500/mo. I watch the Trulia rental listings pretty closely; it’s not unusual for new owners to ask for super high rents only to retreat later. Same story with 390 Myrtle in Laguna. The pictures, listing description and broker haven’t even changed, just the price. 390 Myrtle now lists as a vacation rental. If so many properties profiled are “10”s, what does a “3” look like? If you think you’ll never find an “affordable” local home, this may depress you further: One-in-three Orange County homes listed for sale are priced at $1 million or more. Yes, part of that eye-catching number is due to inflation – a huge run-up in home prices in recent years that created more million-dollar homes. But some of it is attributable to intriguing trends this summer that are driving the upper crust of Orange County real estate. According to Steve Thomas’s ReportsOnHousing, there were 2,372 homes listed for sale in the official brokers system at $1 million-plus on Aug. 27, up 13 percent from a year ago. The rest of the market is shrinking, with 4,853 homes priced at less than $1 million on Aug. 27 – down 16 percent from a year ago. Active listing of higher-priced housing means that the market share of seven-figures residences was 33 percent of all homes for sale on Aug. 27 vs. 27 percent a year ago. Buyers are opening escrows for the pricier homes at a quick rate, too, with 390 new escrows for million-dollar homes in the 30 days ended Aug. 27, up 16 percent from a year earlier. There were 2,332 new escrows opened for cheaper homes in the period, up 8 percent from a year earlier. Thomas also calculates a “market time” benchmark that tracks how much time it theoretically takes to sell all the inventory in local brokers’ for-sale listing network at the current pace of dealmaking. The top of the market looks a tad pokey in this calculation. By Thomas’ math, as of last Thursday it would have taken 182 days to sell all the listed million-dollar inventory at the current pace of new escrows – little changed from 187 days a year ago. Buying of cheaper homes, by contrast, has picked up. Market time was 62 days on Aug. 27 vs. 80 a year ago. I wonder what the percentage would be if jumbo loan rates weren’t so “affordable”. A zombie happens when the homeowner has packed up and moved out – but the mortgage holder has not taken title to the property. What that means is that, usually, all maintenance stops. Lawns aren’t mowed. Snowy sidewalks are not shoveled. Broken window panes are not replaced. Thieves may steal the piping, wiring, sometimes even appliances. Squatters may occupy the dwelling. The house very quickly becomes an eyesore – and a rule of real estate thumb is just one derelict eyesore on a block can ruin the whole block. And a few in a neighborhood can lower the property values throughout the community. One thing I have never fully understood about “zombie” or “cloud” properties: Does (in these examples) the lender keep current property taxes, insurance, HOA dues and the like? If true, then financial horse sense to would indicate that there must be a ROI tipping point at which the lender throws in the towel, completes foreclosure and sells the property at market. If false, then do not governments, and in particular, HOA have superior position to take the property? Taken to its logical absurdity, a house will decay and fall to the ground in a pile of rubble before the lenders or anybody else devises a cure. You are not missing anything. In fact, your last sentence gets right to the heart of the matter. Los Angeles had to pass an ordinance to force the banks to maintain these properties because they were subject to vandalism and falling to rubble. When the owner abandons the property and the bank fails to foreclose, the property is shunned by everyone, and nobody pays taxes, HOA dues, or any kind of maintenance. Strictly speaking, the owner is still liable, but people with assets don’t abandon houses, so collecting from owners is generally a lost cause. This is why local governments go after the lien holders, but they have limited ability to force a lien holder to do anything as the lien holders will disavow their claims if the property’s salvage value is less than the amount owed on it. The local government usually ends up the bagholder. Lenders will pay the property taxes and HOA dues to protect their lien position. In a state like California where you have 5 years before the county will foreclose, a lender can choose not to pay the taxes if they expect to sell before then. In some Midwest rustbelt areas they may also choose to let the county take the property because the value is less than the taxes owed. This was particularly common in Detroit. The repairs and maintenance are required by many municipalities now, but it’s still kind of crazy to me that a lender has to maintain a property that they don’t have ownership of. A mortgage note gives them the option to foreclose to recover their loan proceeds, but it’s not required that they foreclose and technically the borrower still holds title to the property even if they choose not to live there. The current level is less important than whether it’s being filled up or drained. I’d rather have an empty glass that is filling up more quickly than I can drain it, than a full glass with a hole in the bottom. Is the housing market getting better, worse, or is it stable? My view is that the hole in the bottom has been plugged, mostly. Artificially, yes, but nonetheless; sometimes the result is more relevant than the means. Sequestering the distressed inventory has allowed the rest of the housing market to find its own level based on rates, demand, and incomes. Incomes are improving and are likely to show progressively better improvement over the next few years. Rates are likely to remain low until incomes rise — due to natural economic forces and central bank juice. Housing demand is closely tied to population growth which is also closely tied to economic growth. A recovering economy means rising housing demand. Main street is doing just fine. Wall street is having difficulty pricing the main street recovery. China is growing. Maybe not as quickly as the stock markets would like, but growing still. The Chinese stock market is generating bag-holders at an unprecedented rate, which looks like economic retracement for those who believed the prior valuations. But it’s not. It’s just the market reining in investors speculative coursers front-running the recovery. I agree with your assessment about whether or not the glass is filling or emptying. For me, I would like to see more reporting on the levels relative to historic norms. While I agree that the improvement is noteworthy, by failing to report the relatively poor level of performance historically, it gives a false sense of what’s going on. I believe the financial media intentionally under-reports on relative historic performance because they want to present a narrative of improvement rather than a narrative of truth. The full narrative is that housing is weak but improving. They keep leaving off the weak part. Weakness is relative. Historic housing performance resulted from economic conditions that are different than today. Comparing present to past housing performance, then concluding that current conditions are “weak”, implies that historic performance is a better indicator of where housing “should be”. It also implies that historic performance was normal, when it may have been too strong. Maybe current sales are more normal than historic sales, which were inflated by loose credit conditions. Maybe current sales are strong given the recent boom and bust cycle. Either way, sales are what they are. What matters is where housing performance is headed, not where it’s been. We may never see historic norms again. Look at interest rates. Sometimes the population doesn’t revert to the mean as much as the mean follows the population. In other words, under MY alternative factual scenario, I believe rates would be here. Sure, fine. And under MY alternative factual scenario, I believe rates would have moved in the opposite direction. Reminds me of torts class. There was always that one person who wasn’t comfortable with the result so they had to change the fact pattern. What if instead of x, the defendant did y? Well, then the result would be different. What if the sun revolved around the earth, the earth was really big and hot, and the sun was smaller, temperate, and covered with water? When the historic norms show great long-term stability, like they do with new home construction, departure from those norms is a red flag. Perhaps if a market is depressed long enough, it becomes a new norm, but it doesn’t necessarily reflect a “normal” based on unfettered market conditions that we will ultimately return to. For example, existing-home sales in 1980s were higher in Orange County than in any of the last 8 years. We have many more residents today, so if houses aren’t turning over at the same velocity 30 years later, something isn’t right. It’s hard to compare OC in the 80s with OC today. There was a huge influx of high-paying aerospace jobs in combination with a relatively large amount of developable land. Existing homeowners could easily move into a new home because they could sell their existing one. Rates were falling at the same time that incomes were rising and taxes were falling. Prop 13 made homeownership more desirable. Today we have rising taxes, limited housing supply (thanks to Prop 13 and zoning), rates are bouncing on the bottom, and high-paying jobs are harder to come by. Historic norms are dependent on how local and regional economics change over time. A better contemporary comparison with OC in the 80s might be Austin, or even Denver. Something may not be right, or many things may not be right. The result is that local property values are on a different guide path than before. Look at Detroit. Comparing current trends to historic trends tells you there is a problem, but not whether the problem will persist, or how it might be rectified. A recent Corelogic report found that foreign buyers are pulling back from the U.S. housing market, but this trend doesn’t seem to be influencing Texas markets. CoreLogic’s Chief Economist Frank Nothaft found that in relation to the first few months of last year, home sales jumped 9 percent with the help of lower fixed mortgage rates by one-half percentage point, but foreign buyers did not help with this increase. The lack of foreign homebuyers is mostly due to the strengthening U.S. dollar against currencies used by many foreigners who buy homes in the U.S, Nothaft said. Almost half of single-family houses in the New York and Washington metropolitan areas are losing value, a sign that buyers’ tolerance for high prices in many large U.S. cities may be reaching a limit. … Because the index is of only single-family homes, it doesn’t include Manhattan. 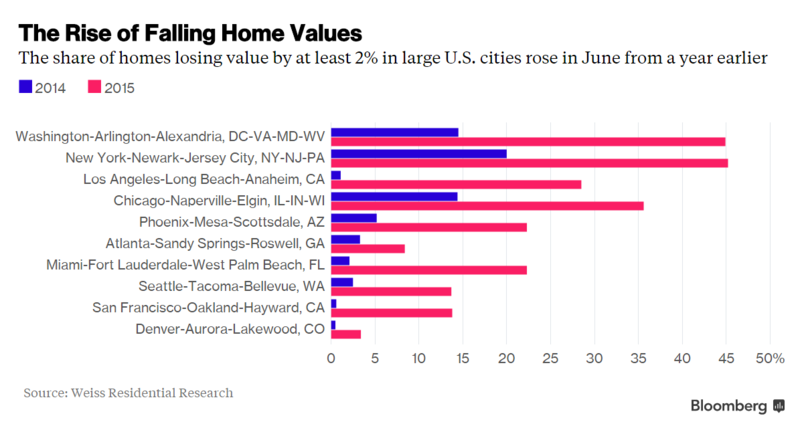 More properties also were in decline in Los Angeles, Chicago, Phoenix and Miami. It’s difficult for a bomb to go kaboom when the explosives are missing (toxic mortgages haven’t been originated in SEVEN years). Almost all assets (in particular OC Housing) have been bubbled by the FED. And after 30+ years of perpetually cheaper borrowing cost, they can’t drop rates below 0 percent. All they can do is QE, which has a declining impact on the economy. It’s like a drug, which requires more to receive the same benefit. It’s all coming to an end soon … Bubbles don’t deflate, they POP. Just because half of homes are losing value doesnt mean the other half is gaining… Perhaps the other half or parts of that half are flat? A U.S. appeals court revived three lawsuits filed by the City of Miami against Wells Fargo (WFC), Bank of America (BAC) and Citigroup (C), alleging predatory mortgage lending practices against minority borrowers. In a unanimous vote, the 11th U.S. Circuit Court of Appeals reversed a lower court’s dismissal of the city’s claims under the federal Fair Housing Act. Miami’s lawsuit alleges the three banks engaged in a long-term lending discrimination in its residential housing market programs. “It is clear that the harm the city claims to have suffered has a sufficiently close connection to the conduct the statute prohibits,” Circuit Judge Stanley Marcus wrote. Other cities like Baltimore, Chicago, Los Angeles and Memphis have met with mixed results attempting to bring suits against the lenders for what they call predatory lending targeted at black and Hispanic homebuyers. The lawsuit in Miami charged that the three banks steered black and Hispanic borrowers toward higher-cost loans. The city said in its brief that this “reverse redlining” led to a large number of foreclosures, lower property tax collections and increased cost to the city to deal with the resultant property values loss and concomitant blight. In July 2014, U.S. District Judge William Dimitrouleas in Fort Lauderdale, Florida dismissed Miami’s lawsuits. He said the city lacked standing to sue, and that the alleged harm was too remote from the banks’ conduct. But the appeals court said that standard was too stringent and that banks could have reasonably foreseen the “attendant harm” from their alleged discriminatory lending. The 11th Circuit did not rule on the merits. Your sub-headline made me think of Clubber Lang. That might actually make a good cartoon for this blog. Nice idea. I will work on that one. For the reporting period of July through mid-August, the Federal Reserve reported in its August 2015 Beige Book released Wednesday that economic activity continued to expand across most regions and sectors, while the majority of reports on residential real estate markets across the 12 Fed districts were positive. Six districts reported moderate economic growth since the previous Beige Book was issued in mid-July, five districts (New York, Philadelphia, Kansas City, Atlanta, and Dallas) reported modest growth, and one district (Cleveland) reported only slight growth, according to the Fed. The reporting period for the latest Beige Book found widely improved existing home sales and residential leasing, while most areas saw an increase in home prices. The Fed found improved residential real estate activity across all districts; home sales and prices increased in every district. In Richmond and Kansas City, sales of lower- and medium-priced homes outpaced sales of higher-priced homes, while the demand for multi-family homes was more robust in Cleveland, Richmond, and San Francisco. Robust demand and declining inventory were the driving factors behind the increase in home prices, according to contacts in most Fed districts. Inventories in nearly all districts declined or stayed flat, except for Kansas City, where they slightly increased. Contacts in Boston, New York, and Richmond reported bidding wards among buyers due to low inventory. If some of the biggest whiners in the industry say the problem is gone, then standards must be way too loose. Many factors, on the demand and supply sides, continue to hinder the home-construction market in the U.S. from returning to normal. But, several home builders say, the availability of construction loans no longer is one of them. Indeed, lenders are opening the spigot at a steady, albeit moderate, pace for commercial and residential construction alike, which bodes well for output in those industries. That, in turn, stands to benefit the U.S. economy, given that rising construction spending contributes greatly to gross domestic product. Figures released Wednesday by the Federal Deposit Insurance Corp. show that total outstanding balances on construction loans from FDIC-backed institutions amounted to $255.8 billion in the second quarter, up 3.9% from the first. That marks the fifth consecutive quarter of double-digit, year-over-year percentage growth as construction lending rebounds from its nadir of $201.5 billion in early 2013. The main residential component of that total–loans for constructing homes of single- to four-family units–also continued to gain ground this year. Outstanding balances on loans from FDIC-backed institutions for building those houses totaled $56.1 billion in the second quarter, up nearly 4.7% from the first. That’s been the sticking point in recent years. Even with a good gain in new-home sales in July, the pace of sales that month amounted to only 51% of the average annual pace of the most recent normalized market in 2001 to 2003. Home construction needs to return to its normal output in order to contribute meaningfully to the U.S. economic recovery. Opinions are plentiful on which factors are the biggest hindrances to home construction. But many say that construction lending no longer is one of them, which the FDIC figures underscore. Mortgage Access at a Tipping Point: Is This the New Normal? * After 18 months of signaling mortgage credit availability increasing, the Zillow Mortgage Access Index has been roughly flat for two straight quarters, indicating the ease with which consumers can obtain a mortgage may be plateauing. * The two consecutive quarters of stagnation in the index lend credence to the idea that we have reached a new credit availability normal: Credit is much looser now than it was in the wake of the housing collapse, but stricter than during the bubble years. For almost two years, mortgages had been getting increasingly easy to obtain. But over the past two quarters, that easing has stalled, potentially signaling a new normal in mortgage lending in which loans are much easier to obtain than the dark years of the recession, but not quite as easy as the go-go years of the housing boom. Bernanke’s taper talk in May 2013 is what started it all, and as good ol’ Mellow Ruse predicted, lenders would respond to increasing rates with looser standards to maintain volumes. I remember that prediction. You nailed it. A recent article by Jason Faberman and Alejandro Justiniano at the Chicago Fed shows that there is a strong relationship between quit rates—as a proxy for the pace of job switching—and wage growth. Movements in the quit rate and wage growth are both procyclical. A tighter (weaker) labor market implies workers are more (less) likely to find better employment matches, and employers are more (less) willing to offer higher wages to attract new workers and retain existing workers. To get some idea of the different wage outcomes of job switching versus job staying, we can use microdata underlying the Atlanta Fed’s Wage Growth Tracker from the Current Population Survey. The following chart plots the quarterly private-sector quit rate (orange line) from the Job Openings and Labor Turnover Survey using Davis, Faberman, and Haltiwanger (published in 2012 in the Journal of Monetary Economics) estimates before 2001. Also shown is the median year-over-year wage growth of private-sector wage and salary earners who switched jobs (blue line) or stayed in the same job (green line). Job stayers are approximated by the restriction that they are in the same broad industry and occupation as 12 months earlier and have been with the same employer for each of the last four months. Job switchers do not satisfy these restrictions but were employed in the current month and 12 months earlier. The correlation between the quit rate and median wage growth is strongly positive and is slightly higher for job switchers (0.91) than for job stayers (0.88). In most periods, the median wage growth of job switchers is higher than for job stayers. This difference is consistent with the notion that job switching tends to involve moving to a better-paying job. However, during periods when the quit rate is slowing, median wage growth slows for both job stayers and switchers (reflecting the correlation between quits and wages), and the wage-growth premium from job switching tends to vanish. Since the end of the last recession, the quit rate has been rising and a wage-growth premium for job switching has emerged again. Interestingly, during the last year, the wage growth of job stayers appears to have strengthened as well, consistent with a general tightening of the labor market. This report by Bloomberg says the complete opposite is happening right now. Well if brokers are saying it, it must be true. Irvine buyers rejoice! “The U.S. government has initially underestimated job growth for almost every August over the last decade, a trend that could make it harder for the Federal Reserve to decide if an upcoming employment report will signal America is ready for a rate hike. The Fed said in July it needs to see “some” further improvement in the labor market before raising rates. The Labor Department’s jobs report for August, which will be released on Friday, will be the last monthly employment report before the Fed’s Sept. 16-17 policy review. But like many economic indicators, it is subject to revisions as employers turn in questionnaires late and government statisticians re-estimate seasonal swings in the data. Between 2005 and 2014, August was the month with the lowest first estimate for job growth relative to revisions that were published in the employment reports for the subsequent two months, a Reuters analysis found. Over that period, on average the government found 58,000 more jobs added to payrolls in August than initially figured. Job growth in August was revised lower only in 2005 and 2008. For this Friday, the number that market participants and economists are looking for is 220,000, roughly in line with the pace of job creation over the last few months, according to a Reuters poll. Far fewer than that and bets on a September Fed liftoff will sink fast. “The risk for a negative surprise in August seems to be much larger than the risk for a positive surprise,” said Harm Bandholz, an economist ay UniCredit in New York. Despite the flaws, several Fed policymakers recently have signaled the report’s importance. Many analysts think it could be the deciding factor for whether the Fed hikes rates this month, although the U.S. central bank also has an eye on global financial market turmoil. The Labor Department acknowledged its initial estimate for August has tended to be revised higher. John Mullins, an economist at the department’s Bureau of Labor Statistics which produces the monthly employment report, said the revisions have been notable across a variety of industries but were most common in highly seasonal sectors. Adjusting the data for seasonal swings is important because it can help give an idea about the economy’s underlying strength. Job cuts at construction sites during the winter, for example, might signal the economy’s direction only if the layoffs are more than what normally happens when the ground freezes. He did not speculate on why revisions in August would be regularly higher. August is not alone in this sense – at least since the last recession. Every month but June and April have on average had upward revisions since 2010, the year the labor market recovery kicked into gear after the 2007-2009 recession. During the recession years, initial job tallies on average were subsequently revised lower in almost every month. I noticed few houses in one of the coastal cities of OC were purchased recently and then immediately put on market for rent. If you do the math the capitalization rate is about 1-2%. There are 85 houses for sale and 35 ones for rent. Given the very small pool of people willing to rent at such prices, I wonder what these buyers were thinking.